We’ve all swooned over gorgeous million dollar kitchens we would love to have in our Dream Home, but how about taking a closer look at kitchens for the rest of us? You don’t need to break the bank to have a fabulous kitchen. The following kitchen remodeling ideas are for mid-range kitchens to inspire you to implement a few ideas to bring your current kitchen up to date. A little paint, new countertops and open shelving can go a longggggggg way for a relatively small price. I’m not gonna lie, this first farmhouse kitchen is my inspiration kitchen for our recent kitchen remodel. I just love it. The open shelves, the drawers instead of cabinets, the subway tile, the skillets…I could go on and on. We purchased the lake house my grandfather built in the 70’s and every inch of it needed to be updated. We’re about halfway there, but the kitchen was the first thing on my list! I love the farmhouse style and have always wanted a farmhouse kitchen. The lake seems like the perfect place to have one! We went with Ikea kitchen cabinets (all drawer style) and they are holding up fabulously! I am so happy with that decision. 30″ Stainless Range Hood – this model has a fan power of 600CFM, which is sufficient for “normal” day to day cooking. If you do a lot of frying or indoor grilling, you’ll want a more powerful fan. By giving the lower cabinets a fresh coat of white paint, and replacing the upper cabinets with open shelving, these homeowners spared themselves a huge expense. New butcherblock countertops allow for a new countertop configuration with the added space of a peninsula. Subway tile and a farmers market sign turn this space into a great small farmhouse kitchen! Wire basket lights – 2 pack. Butcher block countertops are a fantastic alternative to granite and marble for a fraction of the cost. They do require upkeep, but it is not time-consuming, and they provide an instant warmth to your space. If you’re going for a rustic farmhouse kitchen look, consider butcher block. We had it in our last kitchen and it held up great with our kids and lots of cooking. All are beautiful kitchens and yes, I like it that someone has finally showed us common folks, that we can have gorgeous kitchens on a layman’s wage! Thank you! Absolutely! We had a *very* tight budget on our kitchen remodel and with the help of Pinterst, Ikea cabinets and open shelving we stayed on track and are happy with the results! Thank you for your comment! These are beautiful. I especially like the one with the chalkboard wall. I have been thinking about doing that to my kitchen for some time. I love chalkboards! They are so handy to have around the home. I haven’t done a wall yet, but I am thinking about doing the back of the door in my kitchen! I am one of those random “common folk” so to speak lol…. My only complaint about the ‘farm house’ look is that people constantly want to paint their cabinets! I have press board interior cabinets but the outside is an oak wood. Why on earth would I cover that lovely wood grain up with paint of any kind???? Me, I plan on stripping and re-staining my wooden cabinets and re-sealing them. No “freshly painted cabinets” in my tiny tiny gallery kitchen. 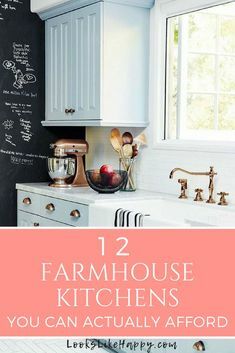 That is true- a lot of farmhouse cabinets are painted! I guess it depends on the condition peoples’ cabinets are in- and if they realllyyyyy want colored cabinets! I’ve been obsessed with farmhouse kitchen looks lately, even though mine is not that style. Something about the look of the copper sinks has me hooked! I know! I love that sink so much! We had a copper farmhouse sink in our old kitchen and it was so easy to care for!